The continued obscurity of the Soviet author Vasily Grossman is not easy to understand after one has spent any time with his writing, but a few conjectures come to mind. His masterpiece, Life and Fate, was published in the United States in 1985, and in 1985, the year that Mikhail Gorbachev became general secretary of the Soviet party, Russian literature in America was in a sense “spoken for” by the increasingly umbrageous and controversial Aleksandr Solzhenitsyn. Both Grossman and Solzhenitsyn had written vast, dense, synthesizing epics about life behind the iron curtain, but whereas Grossman was dead, Solzhenitsyn was very much alive, and in fact a celebrity, periodically sallying out from rural Vermont to fulminate against Western decadence or something else that caused excitement. Life and Fate, on the other hand, could do nothing unless it was read, and with 871 pages and over 160 characters, it was and remains a book that’s easier to tip one’s hat to than read. And then there is the likelihood that the book was somewhat overshadowed by the extraordinary story of its survival, a story that exposed to the world the irreparable hairlines in the Soviet machinery. Grossman wrote much of Life and Fate after Stalin’s death, in a period that his former newspaper colleague Ilya Ehrenberg called the “Thaw.” Grossman was hopeful, therefore, that the censors would allow its publication. Instead, in February of 1961, four months after he had submitted the manuscript, Life and Fate was “arrested”: KGB officers confiscated all known copies held by the author and his friends. After Grossman appealed personally to Khrushchev, a toadying clerk named Mikhail Suslov told him that the book could not be published for 250 years. One of the sins of Life and Fate was its tacit parallelism between the Nazi and Soviet regimes, and Suslov’s declaration, with its assured disregard for mortality, bore much in common with Hitler’s slogan of a thousand year Reich. Yet there were two copies of the book still hidden. In 1974, 10 years after Grossman died, his best friend Semyon Lipkin managed to get this tome microfilmed, enlisting the help of the satirical writer Vladimir Voinivich and a nuclear scientist named Andrei Sakharov. The process took months and remarkable temerity. Finally Voinivich smuggled it from the country—and even then it was not published anywhere until 1980. The story tells a lot about the Soviet government and the inhuman pointlessness of totalitarianism, but the contents of Life and Fate tell much more and do so in the style of an artist who, after years of high-pressured gestation, had arrived at the fullest and most lucid expression of his material. For in spite of its length, Life and Fate is made up of thousands of compressed, angular paragraphs that, at their best, possess the transparency and adamantine luster of diamonds. The people in the hospital had been struck by her calm and the number of questions she had asked. They hadn’t appreciated her inability to understand something quite obvious—that Tolya was no longer among the living. Her love was so strong that Tolya’s death was unable to affect it: to her, he was still alive. She was mad, but no one had noticed. Now at last, she had found Tolya. Her joy was that of a mother-cat when she finds her dead kitten and licks it all over. A soul can live in torment for years and years, even decades, as it slowly, stone by stone, builds a mound over a grave; as it moves towards the apprehension of eternal loss and bows down before reality. The soldiers finished their work and left; the sun had nearly gone down; the shadows of the plywood boards over the graves lengthened. Lyudmila was alone. There are whole books contained in each of these paragraphs, and still, each informs the next, increasing the pressure of Lyudmila’s agitated delusion to climax at the breathtaking image of a tormented soul gradually accepting a death, and then relieving the moment by moving out of Lyudmila’s mind to observe the departing soldiers and lengthening shadows. The raw material for Life and Fate was the Battle of Stalingrad, in which Grossman participated nearly from start to finish. When the Soviet Union was yanked into the war with Germany’s surprise attack in 1941, Grossman was hired as a journalist for the Army newspaper Krasnaya Zvezda, or Red Star. He was then a young writer deemed by Maxim Gorky, with qualifying condescension, to show promise, but it does not appear to be an exaggeration to say that during the war Grossman wrote the finest features from the Eastern Front and was for soldiers the most beloved and respected of all war correspondents. His articles are abysmally difficult to get one’s hands on today (as was Life and Fate, until NYRB Classics reprinted it in May 2006, thankfully retaining Robert Chandler’s wonderful translation), but when Antony Beevor and Luba Vinogradova edited and translated his war diaries and newspaper correspondence in a publication called A Writer at War, we were given a fresh and invaluable glimpse into both the Red Army’s defeat of Nazi Germany and the welding of Grossman’s artistic vision. Beevor is an excellent, if at moments verbose, guide through these diaries, and his role is all the more honorable because Grossman’s firsthand account renders his own history of Stalingrad, not subsidiary, but no longer authoritative. In Stalingrad Beevor wrote that the war in Russia “became a personal duel [between Hitler and Stalin] by mass proxy.” In Grossman’s diaries and articles, however, the proxies are brought to the fore. Stalin’s dislike of Grossman seems partly arbitrary, as arbitrary as his fondness for Mikhail Bulgakov, but it was surely fed by Grossman’s refusal—or inability—to pay sufficient obeisance to the overlord in his features. 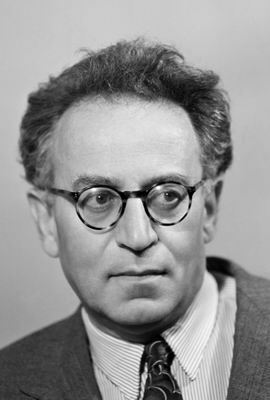 Whereas the articles of Ilya Ehrenberg are overtly political, consisting of long strings of eloquent and eventually tiresome nationalist truisms, Grossman’s reportage is an almost atmospheric blend of personal profiles, naturalist description, anecdote, army in-humor, philosophy, and emotional outburst. blood rushes from your heart, and you know that the terrible sight that your eyes have taken in is going to haunt you and lie heavily on your soul all your life. It is strange that when you sit down to write about it, you don’t find enough room for it on paper. You write about a tank corps, about heavy artillery, but suddenly remember how bees were swarming in a burning village, and a barefooted old Belorrusian climbed out of a little trench where he was hiding from shells and took the swarm off the branch, how soldiers were looking at him, and, my God, one can read so much in their thoughtful, melancholy eyes. In these little things exists the soul of the people and our war with its suffering and its victories. 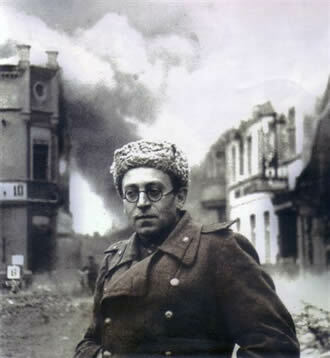 Vasily Grossman at war in Germany in 1945. In Life and Fate Grossman does write about a tank corps (for it was finally the strength of Soviet armor that turned the balance along the Volga), led in this case by the charismatic Novikov and overseen by the oily commissar Getmanov. But Grossman also catches so much more of the Soviets at war: He writes about artillerymen, snipers, radio-operators (who were mostly women), sappers, orderlies, and air-force pilots. He writes about party members and secret police, as well as prisoners of the gulag, hardened criminals, kulaks, and old terrified Bolsheviks who mistakenly supported Trotsky. He writes about the Shtrums, bourgeois Muscovites hovering charily beneath the cloud of Stalinism and bracing against the approaching storm of the Wehrmacht. He writes about Adolf Eichmann, General Paulus, Lieutenant-Generals Yeremenko and Chuikov, and, in one remarkable cameo, Stalin himself. A dead soldier was lying on the ground between the remains of a mortar and some slabs of asphalt thrown up by a shell-burst. Now that Krymov was so full of hope and exaltation, he found this sight strangely upsetting. He had seen plenty of corpses in his time and had usually felt quite indifferent. This soldier, so full of death, was lying there like a bird, quite defenceless, his legs tucked under him as though he were cold. A political instructor in a grey mackintosh ran past, holding up a well-filled knapsack. Then a group of soldiers came past carrying some anti-tank shells on a tarpaulin, together with a few loaves of bread. The corpse no longer needed bread or weapons; nor was he hoping for a letter from his faithful wife. His death had not made him strong—he was the weakest thing in the world, a dead sparrow that not even the moths and midges were afraid of. Fascism arrived at the idea of the liquidation of entire strata of the population, of entire nations and races, on the grounds that there was a greater probability of overt or covert opposition among these groupings than among others: the mechanics of probabilities and of human aggregates. But no! No! And again no! Fascism will perish for the very reason that it has applied to man the laws applicable to atoms and cobblestones! Man and fascism cannot co-exist. If fascism conquers, man will cease to exist and there will remain only man-like creatures that have undergone an internal transformation. But if man, man who is endowed with reason and kindness, should conquer then fascism must perish, and those who have submitted to it will once again become people. Compounding Grossman’s abhorrence for fascism (such words seem pathetically deficient) was the fact that he was a Jew and through the war years believed in his heart that his mother had been killed by the Nazis. This was true—she lived in the Ukrainian town Berdichev amongst a large Jewish population who, in 1941, were rounded together, marched to a gully on the edge of town, and executed—but it was only with the Red Army’s counter-advance toward Berlin that he discovered she had died in one of the earliest purges of the then un-named Holocaust. Grossman’s journalism now took on the crusade of divulging the nature of the death camps, and in fact his articles on the genocide were the first written. In A Writer at War, Beevor reproduces most of Grossman’s essay, “The Treblinka Hell,” which gives an extraordinarily clear-eyed examination of the camp attributes and Nazi tactics for crushing the human spirit and forcing people towards their own slaughter. It has proved almost impossible to write about the Holocaust without becoming bathetic or cheap, but Grossman did it as both a reporter and as a novelist, when he once again metamorphosed the material for Life and Fate. The shuffling quietened down; all you could hear were occasional screams, groans and barely audible words. Speech was no longer of any use to people, nor was action; action is directed towards the future and there no longer was any future. When David moved his head and neck, it didn’t make Sofya Levinton want to turn to see what he was looking at. Her eyes—which had read Homer, Izvestia, Huckleberry Finn, and Mayne Reid, that had looked at good people and bad people, that had seen the geese in the green meadows of Kursk, the stars above the observatory at Pulkovo, the glitter of surgical steel, the Mona Lisa in the Louvre, tomatoes and turnips in the bins at market, the blue water of Issyl-Kul—her eyes were no longer of any use to her. If someone had blinded her, she would have felt no sense of loss. . . . The boy’s movements filled her with pity. Her feelings towards him were so simple that she no longer needed words and eyes. The half-dead boy was still breathing, but the air he took in only drove life away. His head was turning from side to side; he still wanted to see. He could see people settling onto the ground; he could see mouths that were toothless and mouths with white teeth and gold teeth; he could see a thin stream of blood flowing from a nostril. He could see eyes peering through the glass; Roze’s inquisitive eyes had momentarily met David’s. He still needed his voice—he would have asked Aunt Sonya about those wolf-like eyes. He still even needed thought. He had taken only a few steps in the world. He had seen the prints of children’s bare heels on hot, dusty earth, his mother lived in Moscow, the moon looked down and people’s eyes looked up at it from below, a tea-pot was boiling on the gas-ring. . . . This world, where a chicken could run without its head, where there was milk in the morning and frogs he could get to dance by holding their front feet—this world still preoccupied him. Grossman’s idée fixe for freedom never changed, but the optimism engendered by winning the war did not last. Soviet authorities, girded with the specious maxim “Do Not Divide the Dead,” censored his reports on the Holocaust if he mentioned that its victims were Jews. For his fiction he was to suffer the denunciation and greasy condescension of apparatchik fools. For a time, his life was in so much danger that he fled Moscow to winter in a primitive cottage and was only adventitiously reprieved by Stalin’s death. His marriage with a bland woman grew loveless and painful. As he had sometimes done before the war, he freighted his conscience by accepting petty concessions to the government, agreeing officially to falsehoods, retracting truths, and submitting to other collusions that oppress the soul. Then his magnum opus was seized and suppressed. In 1964, a persona non grata whose greatest books were yet unpublished, he died a slow death from stomach cancer. People wished no one harm, yet throughout their lives people did harm to others. Nevertheless, human beings were human beings. And it was a marvelous, divine thing, because, whether they wanted to or not, they were not allowing freedom to die, and even the most awful and terrible among them nurtured freedom in their awful, distorted, warped, yet human souls. Grossman understood freedom the way the religious understand the soul, as the irreducible essence of life. Individuals can never entirely smother it while they live, so it is in the small, inconspicuous things they do that they reveal the pith and beauty of their existences. It was with this conviction that, among the rankest weeds of the barbaric 20th century, the flower of Grossman’s humanism took root, and has survived him in his rescued though still too-neglected writing. Sam Sacks is an editor at Open Letters Monthly, an online arts and literature review. He lives in New York City.